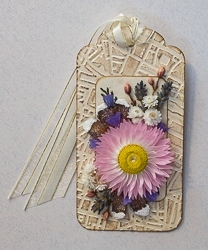 Beautiful everlasting flowers are mounted on embossed card stock for additional texture with satin ribbon. Dried acroclinium flower is used as the focal point, and arrangement is enhanced with statice, lavender, pine cone bits and pearly everlasting florets. Give as a gift or use as a gift tag, favor tag, tree ornament or envelope decoration. Tag is approx. 2" wide by 4" high and comes in a handmade window display box. All the flowers are dried and grown in Em's garden. Note: Available in quantity of one.